Does your pet prefer to stay on their own home turf? If you are called away at the last minute for work or have a holiday planned, a dedicated Pawshake house sitter can come and keep your furry friend company. Sit back and relax knowing a trusted, verified Pawshake house sitter is making sure your pet and home are safe and sound. No cages, no kennels: that’s the true peace-of-mind that comes from Pawshake house sitting! House sitting is an in-home pet care service. A house sitter comes to stay your home for the duration of the time you are away to care for your pets and keep an eye on your home. House sitting is a perfect choice for dogs and cats that don’t like being transported to another location for boarding: such as puppies, older cats and dogs or special-needs pets. House sitting is a great option for pets that suffer separation anxiety, as the familiar sights, sounds and smells of home are more comforting than an unfamiliar boarding facility. It is also ideal for other pets such as fish, small caged animals and even farm animals that are happier in their own familiar space. If you own several pets, boarding might be too expensive or difficult to arrange, in which case a house sitter can be a great pet care solution. As well as keeping your pet happy, house sitting might suit you if you are a little nervous about home security when you are away. It can include extra services such as bringing in the mail, watering plants and taking out the bins for collection. Your house will be lived-in and far more secure with a trusted Pawshake house sitter coming and going than an empty home. Your pet can stay safe and comfortable in their own home with a friendly Pawshake house sitter. Belly rubs and cuddles are always included! Get-to-know the house sitter with an obligation-free meet & greet. When you are ready, book the house sitter easily via Pawshake for premium pet insurance, 24/7 online support and our satisfaction guarantee. You have the power to choose exactly who you want to stay in your home with your pet. Plus, our house sitters set their own rates, making it a much more fair and affordable option than boarding for many pet owners. Your dedicated house sitter will give your best furry friend plenty of play-time and attention, as well as extra services such as bringing in the mail, emptying bins and watering the plants. Your house will be secure and maintained the whole time you are away. Your friendly local house sitter is a few simple clicks away. Just visit the Pawshake homepage or mobile app, enter your suburb and browse house sitters who are ready and eager to come and help you out. Read more about Furever Friends! Read more about Experienced passionate petminder! Using a house sitter for the first time? Enter your suburb into Pawshake, the date-range you need a sitter and the service ‘house sitting’. When browsing through house sitting profiles, closely read about each sitter’s past experience, their service and customer reviews. You might spot a few profiles you like: just send each house sitter a quick message with your dates and requirements. If a house sitter you are interested in is available, organise an obligation-free meet and greet before booking. Introduce your dog, cat or other pets, ask the house sitter any questions you may have and show them around your house. Remember to tell them where you keep your pet’s food and supplies, where cleaning products are kept and other relevant details. Feel great after the meet and greet? Head back to Pawshake to make a formal house sitting booking. Booking through our website automatically activates our Premium Pet Insurance and the Pawshake Satisfaction Guarantee. At this stage, payment is processed but won’t be released to the house sitter until the booking is completed. Premium pet insurance covers your pet in case of illness or injury and third parties for your peace of mind. Pay securely online for automatic insurance coverage on your pet sitting booking. You’re in safe hands with Pawshake. All pet sitters are individually vetted by our team of specialists: less than 20% of potential pet sitters make the cut. 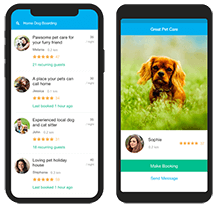 All pet sitters have a detailed profile with personal information and authentic community reviews for you to read before booking their services. Our loving pet sitters are dedicated to your cat, dog, rabbit, bird or guinea pig. Enjoy daily updates and photos from your pet sitter during pet boarding, pet daycare or your dog’s walk. Our friendly customer support team is online to help you 24/7. Should the pet sitter you have arranged and booked be unable to care for your pet, we will do everything we can to find you a replacement pet sitter. This is very rare, but we are there to help if you get stuck. Message a loving pet sitter, and arrange an obligation-free meet & greet. Safely book your pet sitter online to enjoy premium pet insurance and 24/7 online support. Your pet is in safe hands. Your pet sitter will be in touch with regular photos and updates during the pet daycare or pet hosting period. Find the pet sitting service to suit your unique pet care needs. The Pawshake App - for pet sitting in your pocket. Download the free Pawshake mobile app today to find and book your perfect pet sitter. Need pet care, pet daycare or pet hosting services? Sign up on Pawshake and find the perfect pet sitter. Want to help pet owners while they are away or busy with work? Become a pet sitter on Pawshake; it's fun, flexible and free.